Day 6 – I just want to eat! Yesterday, I was actually pretty pain free until about 4:30 pm. I even managed a raspberry yoghurt drink thing for lunch. I finish work at 5, so I decided tojust endure it for the last half hour. Once I got to the train station, I bought a cold bottle of water and used that to cool my cheek for a while, and the pain was almost gone by the time the train arrived. I think all the talking I’d had to do had worn me out and my mouth just needed to rest. I took a painkiller for bed, but one of the less strong ones and it actually worked until morning. Today, the pain was bearable enough that, if it had been a weekend, I would have dealt with it using ice and sleep. But because I had to go to work, I took a painkiller. In terms of pain, things are definitely getting better. Swallowing is still incredibly uncomfortable – it’s this that’s preventing me from eating. Last night, I managed an entire bowl of mashed potatoes/carrots with gravy. 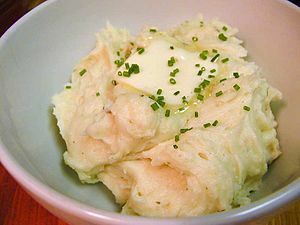 With everything else I’ve eaten, I’ve given up after a while, but I was starving and mashed potatoes with gravy is one of my favourite things in the whole world, so I persevered. I kept trying different ways to swallow and eventually discovered that if I moved the food as far back in my mouth as possible then swallowed with my mouth open I could get it down without moving my cheeks. Luckily Jan had text to say he’d be late and to go ahead and eat so nobody had to witness the disgustingness of me swallowing with my mouth open! Sadly, this trick doesn’t seem to be working today. Swallowing is no longer painful, but it’s very, very uncomfortable/weird. With every swallow, it feels like either the stitches on the right are being pulled out or the wound is being pulled open, which makes me terrified to eat at all. It’s bad enough that I keep having to swallow saliva! My colleague told me she had the same thing and it stopped after the stitches came out, so hopefully this part will be over by Friday (stitches come out on Thursday evening). – No more pain killers!